The east coast is vulnerable during this tremulous time of year, so it makes sense for you to want to batten down the hatches. Decks are often overlooked when it comes to hurricane preparation. We’ve already given you advice to help you prepare your fence for the upcoming hurricane season. With the passing of Hurricane Matthew, it’s possible your attention has been brought to the severe damage in North Carolina. The east coast is vulnerable during this tremulous time of year, so it makes sense for you to want to batten down the hatches. Decks are often overlooked when it comes to hurricane preparation, so read on in order to discover the best ways to protect them. Falling branches are a huge culprit in hurricane damage. Without warning, a branch can fall on your deck, smashing through the wood when sent with the high winds of a hurricane. To protect your deck, make sure you’re trimming any extra and overhanging branches near it. It doesn’t guarantee anything, but it’s certainly a great form of protection. 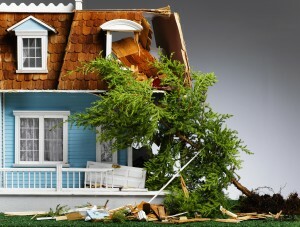 Furniture and lawn decorations are also a problem when blown around by strong winds. Hurricane winds are capable of intense, unexpected force, which can pick up even the heaviest of lawn furniture. Keep these objects in a garage or a basement so they don’t ram into your deck, or any other structure in your yard. Use padlocks to reinforce the weakest part of your deck, the gate, which can be added to many decks as a security precaution. It’s the weakest because it’s got a hinge, and is usually only protected by a small metal lock. A damaged gate can put your home and family at a huge security risk, but can also simply rip off in the winds and, obviously, cause destruction. Let Mid-Atlantic Deck & Fence solve your deck problems today!